carved in three-quarter relief, the deity shown standing in front of a petal-shaped mandorla, holding a lotus bud in the raised right hand and the traditional ‘heart-shaped’ attribute in the lowered left hand, with finely carved features set in an expression of benevolence and reassurance, wearing a simple pectoral ornament and a diadem tied with ribbons which fall down across the shoulders, the layered robes gathered by a knotted belt at the waist and draped with scarves which hang in symmetrical folds cascading down to the block base on either side of the domed lotus-pedestal under the bodhisattva’s bare feet, the fine-grained sugary white marble with encrusted tan-brown earth from burial concentrated on one side and widely scattered on the back, incised with a lengthy dedicatory inscription on the base. The long dedicatory inscription begins with a regnal date: Da Qi Tianbao san nian, which may be translated as “The third year of Tianbao reign of the Great Qi,” corresponding to A.D. 552. 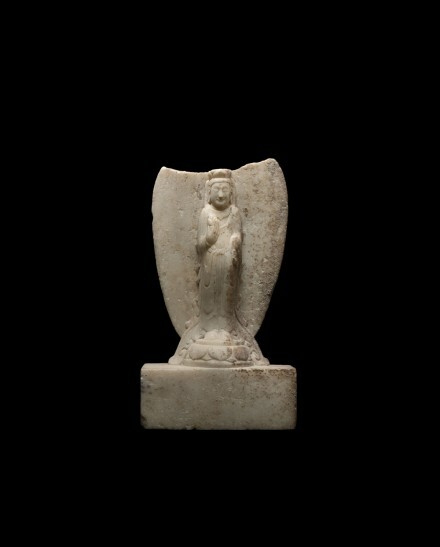 A similarly carved small white marble stele with standing bodhisattva holding the same attributes as the present example and with a dedicatory inscription on the block base including the Northern Qi regnal date Da Qi Qianming yuan nian, corresponding to A.D. 560, was discovered in a hoard of Chinese Buddhist sculptures excavated at the site of Xiude Temple in Quyang, Hebei province in 1953 and is illustrated by Matsubara in a monograph on the discovery entitled Uzumoreta Chûgoku seikibutsu no kenkyu (An Investigation of Excavated Chinese Stone Buddhist Sculptures), Tokyo, 1985, no. 38. Avalokitesvara Padmapani, identified by the lotus held in one hand, was widely venerated from the earliest appearance of Buddhism in China as the one who promises to hear and respond to the prayers of all suffering beings.